UST Training may not approved to offer Class A/B Training in every state and territory but we do have state-specific solutions for UST operators looking for the best possible option. Using our three decades of UST expertise and our position as industry leaders in UST training, we’ll guide you to the best option based on your company’s need, and who we think the best state-specific choices are. When shopping our course catalogue, if you see “Third Party Vendor”, that’s our best recommendation for you–be it another private trainer or a state agency. We are part of an informal network of national training solutions so let us make a referral for you. 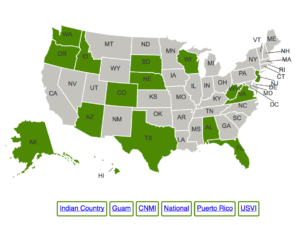 Need solutions in a large number of states? We have them. Contact us at info@USTtraining.com or 866-301-8265.